If they all require ceramic-specific brake pads that's a pretty big knock for me, basically what drove me away from carbon to begin with. I like to be able to swap wheels around and switching pads is easily the most tedious part of that. 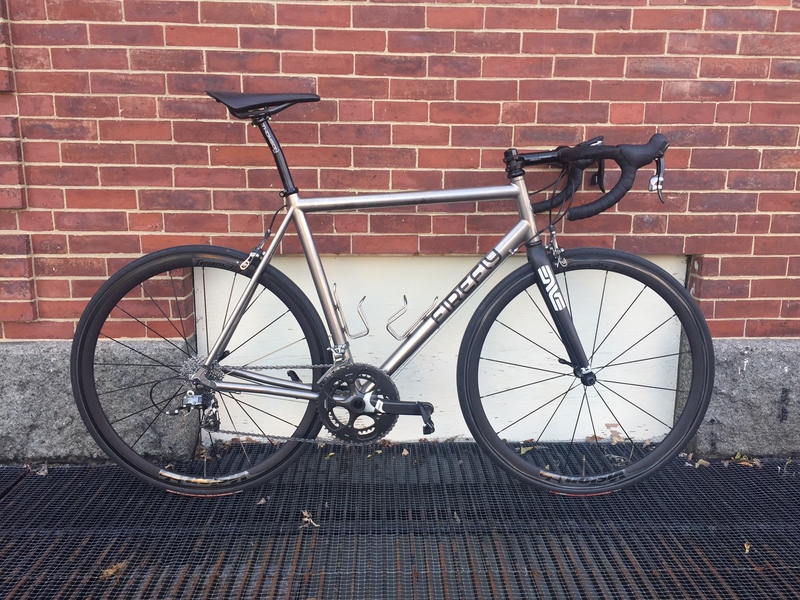 I grabbed a set of Vision Team 35's super cheap recently and I can already tell the anodized track will be toast within 500 miles. I feel like the convenient, light, aero, sub-$1000 all black clincher is still just a dream. Some brake pads work better on the coated rims than others but they're not like carbon wheels. When I road the coated open pros I bought pads that at the time were optimal for braking in the rain, and those same pads work just fine on regular alloy rims. I never had any trouble with the brake track becoming silver either. It's smoother now and they don't have the amazing braking in the rain they once had but they're still black. This is after one 55mi/90km ride. The pads I'm using were clean but probably have about 6,000 miles on them with normal HED Belgium brake tracks. You can already see some silvering (silverizing? silverification?) particularly on the front wheel. Thoe Vision rims are merely anodized, not coated with any durable process. Vision's product description for them says that the brake track is aesthetic and will wear out quickly. Rims with PEO or similar coatings (and I think Vision either has one already or is coming out with one) are a totally different animal to anodized rims such as yours in that pic. NovemberDave wrote: Thoe Vision rims are merely anodized, not coated with any durable process. Vision's product description for them says that the brake track is aesthetic and will wear out quickly. Rims with PEO or similar coatings (and I think Vision either has one already or is coming out with one) are a totally different animal to anodized rims such as yours in that pic. 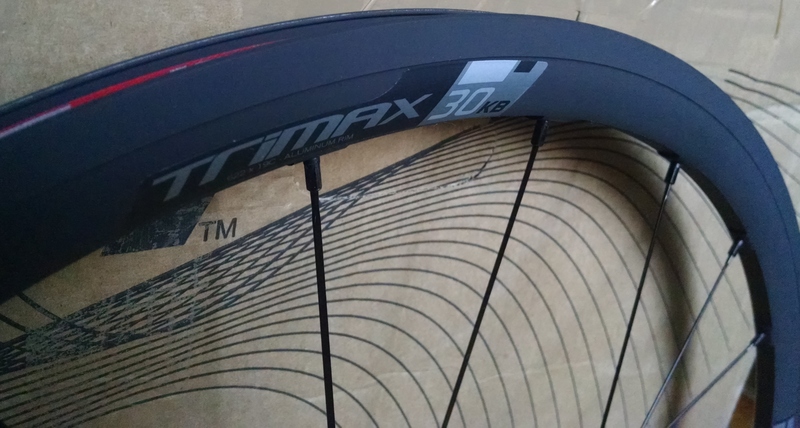 Just got a set of Trimax 30 KB wheels. not so aero but they do look pretty nice. got them for my new bike which I don't have yet, so they will have to wait a couple weeks for their first run. I don't get everybody's obsession with black brake tracks. AJS914 wrote: I don't get everybody's obsession with black brake tracks. For me, it's not about the color black; it's about brake track treatments that provide better braking especially in wet weather. I live in Seattle and it's possibly a more important consideration here than most places. Are you using Kool-Stop salmon pads? From my direct experience, these pads are superior in dry and wet and easy on rims due to its soft compound. I have been using them exclusively for training and racing for many years. Combine that with Dura-Ace 9000 brakes and polymer cables and you will stop on a dime. Based on my understanding, ceramic pads must be used with super-duper track treatments. Personally, I would like to see some data over marketing. I have said this before and say it again, the industry is pushing the envelope of black brake tracks due to aesthetics. Majority of riders admit that their purchase decision of carbon wheels is solely based on aesthetics. Under 300 miles - here's what basic ano starts to look like (as you'll find on Vision & H+S rims). I actually think once it's fully worn off they'll look fine, but in the in-between stage it just looks like you have insanely mucked-up wheels. The only data I need is using some of these wheels and noting their clearly better braking power, especially when wet. IN the late 1990's and early 2000's I used Mavic Open Pro Ceramic and they were great. Now I use Hed Ardennes Black and they are about the same on braking power, and use standard Shimano pads for aluminum rims. jbaillie wrote: I actually think once it's fully worn off they'll look fine, but in the in-between stage it just looks like you have insanely mucked-up wheels. that's why I waited for the 30 KB. Could you give an update on how you feel about those wheels? Thinking about also getting them but I have yet to see any reviews on them. Also, what kind of brake pads do you use with them? Any coated alloy rim (including ceramic) will eventually wear off and taking them out in the rain will quicken this process ten fold. My Boyds became completely silver within a month after taking them out five days a week with most of those days in the wet. In fact, it showed signs of wear literally after the first time it was ever taken out in the rain which was 54kms and I have pictures of it. Braking performance was indeed better while the ceramic coating was still there but noticeably decreased when it was worn out (although still as good as any normal alloy rim).